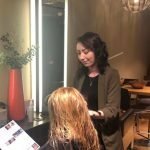 Young Chloe Bellfield has just undergone the Aveda training of excellence and is now a fully qualified Aveda stylist at our Walton salon. She has been a dedicated member of the team for a while now and we’re delighted she’s fully fledged and ready to go out into the hairdressing world with confidence and her own unique style of hairdressing. Like all of our Aveda artists, Chloe is professional, friendly, capable and skilled at hair. Let’s find out more about what Chloe likes to get up to outside her working life as well as her favourite things about life as a brand new stylist…. Tell us about your life outside MAW? Eg: hobbies/where are you from/family? I’m 19 and live in Addlestone with my parents and sister. When I’m not at the MAW salon, I try to spend as my time with my family as I can, we are a close knit bunch and I really enjoy being around them and just hanging out. A few of my friends are at university and I’m obviously working full time, so it can be difficult to grab time to see them, but when we’re all free we love to spend time with each other and catching up on all the gossip and having fun! I’ve recently qualified from my hairdressing apprenticeship and have started working as a stylist at the salon. I still can’t quite believe it, but I’m so glad I’ve made it here. Describe what you do in a few word? In the salon I really enjoy doing women’s colour, as well as cuts and blow drys, but I’ll also helping out the juniors with washing, tidying and rough drys when I have free time. I think it’s really important to work as a team where we can as it feels much better when everyone does their bit. One of the things I’ve always loved about hair, is seeing how different a client can look when they come in, compared with how they go out. How long have you worked at the salon? I have worked at MAW for 3 years now, it’s gone so quick I can hardly believe it! I must be enjoying it! What’s your favourite thing about working with Aveda? I love working with Aveda products as they are natural and gentle to the hair and skin. I especially love the fact that the Aveda products are different to other products on the market because they are plant based, organic, not tested on animals and come in plastic that’s already been used before so it’s better for the planet. Plus they always smell so great! I know everyone says it, but it’s true! Although I have a lot of great memories from working at the salon, doing my apprenticeship and being promoted has definitely been the best. It was such a great moment for me after working hard for so long. The support and encouragement I received throughout training and while working has just been wonderful and will always be one of the best memories I’ll have from here. What’s your ‘go to’ Aveda product? My go to Aveda product is the Shampure Dry Shampoo because it just great for a fresh look on non hair wash days! The Shampure range has always been one of my favourite aromas and the dry shampoo is no different. The bottle sort of puffs out the product in a light wisp into the hair and just gets rid of any greasiness or flyaways. Another of my current favourites is the Light Elements Smoothing Fluid – I am loving this product and using it a lot on my clients for their finished look! It helps create real shine in dry hair and is like a bit of a magic product. You can really get that fresh lovely look. If you could nominate anyone at MAW Aveda for an award for something, who would you nominate and why? It’s so hard to choose! I would personally have to nominate Zoe Tomkins! She has been such a massive help to me while doing my apprenticeship and even now she supports me. She always encourages me to try my hardest which I think is really important to progress. Her help is endless and not only her but all the other girls have really helped me build my confidence within the salon and everyday life – I can’t thank them enough! Love you guys! My skin is pretty sensitive so I use the Aveda ‘Botanical Kinetics all-sensitive’ range, especially the cleanser and moisturiser in the range. They contain organic aloe and oat, which really soothes and cleans my skin gently without aggravating it. Since using it I never have breakouts or bad skin days – I really feel like all the Aveda products are great quality and work so well. Dry Shampoo! Apply dry shampoo before you go to bed, this will allow you to wake up with fresher and fuller looking hair. The Aveda Shampure dry shampoo is great and it will make your hair look and smell fantastic! How do you relax after a busy day at the spa? Definitely a lot of sitting down and chilling out! I like to relax with a nice home cooked meal by my mum, who luckily happens to be a great cook! A decent movie and chocolates always go down afterwards too! So there we have it! Thank you Chloe, it’s been lovely catching up and getting to know you a bit better. 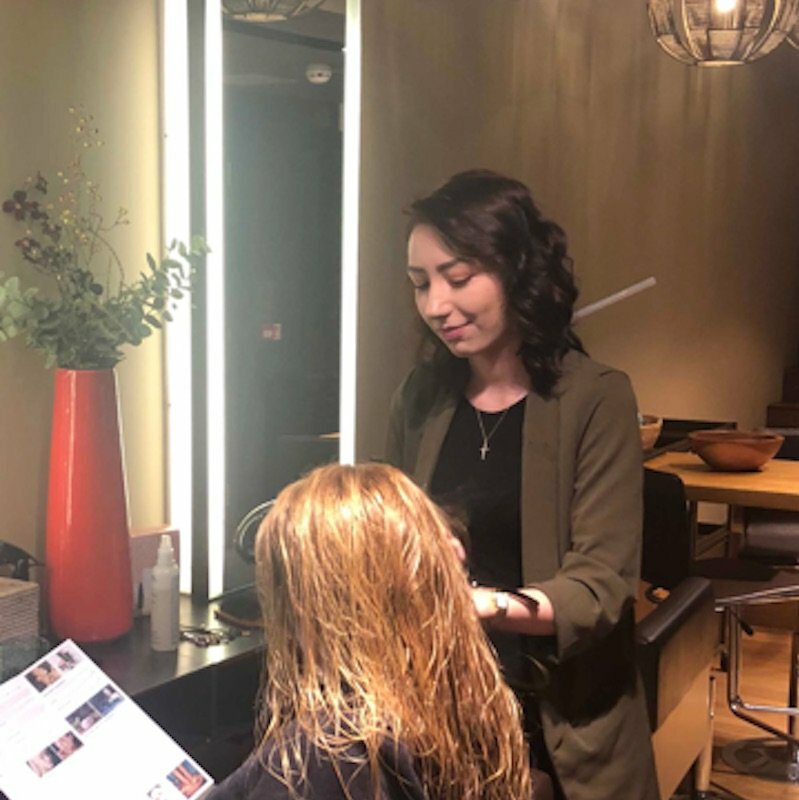 We hope you’ll book an appointment with Chloe and let her go to work on giving you the hair you’ve been dreaming of – her passion and talent should please you no end! To book yourself in for a cut, colour and blow dry give Mary Ann Weeks Aveda Walton a call on 01932 240856 and book yourself in. Don’t forget! New guests get a complimentary Aveda facial or massage, a £10 voucher to spend in store AND a 50ml product of choice. See you for feel great hair soon!